Game description: God of War saw Kratos, a mortal warrior, set upon an epic quest to dethrone a God. But his journey did not end there. In God of War II, Kratos sits atop his Olympus throne, as the new God of War - far more ruthless than Ares ever was. To end his continued torment, Kratos must journey to the far reaches of the earth and defeat untold horrors and alter that which no mortal, or god has ever changed, his fate. God of War II sets an epic stage for a devastating mythological war to end all wars. In God of War II, players retake the role of Kratos. Armed with the deadly blades and blistering rage, players are aided by new breath-taking magic and new brutal combat moves. The journey takes them through vividly striking environments where they are faced with a labyrinth of challenging puzzles and mini-games intricately woven into the story. The violent world of Greek mythology comes to life in gory detail as Kratos encounters new mythical characters, and compete in epic boss battles in his quest. God of War II is a third person action-adventure video game. Sequel to God of War, God of War II is loosely based on Greek mythology, and is set in Ancient Greece. The player controls the protagonist Kratos, the new God of War who has killed the former, Ares. Kratos is betrayed by Zeus, the King of the Olympian Gods, who strips him of his godhood. Kratos is saved by the Titan Gaia who instructs Kratos to find The Sisters of Fate, who will allow him to travel back in time, avert his betrayal and change his destiny. 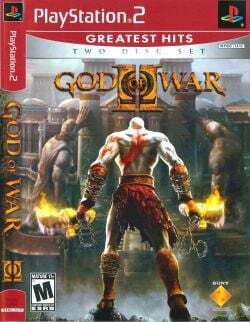 Description: Kratos and other objects and characters have a shifted, ghost like effect around them. Workaround: Go to Config > Video(GS) > Plugin Settings, click "Enable HW Hacks", go to Configure Hacks and enable the Align Sprite hack. Alternatively set Half Pixel Offset to "Special (Texture)". Or go to Config > Video(GS) > Plugin Settings, and set the Internal Resolution to "Native", or set the Renderer to Software mode by selecting one of the (Software) options. Description: There are vertical lines on the screen in under water and hell levels. Workaround: Go to Config > Video(GS) > Plugin Settings,and set the CRC Hack Level to "Aggressive". Or go to Config > Video(GS) > Plugin Settings, click "Enable HW Hacks", go to Configure Hacks and enable the Align Sprite hack. This reduces the number of the horizontal lines underwater. Or go to Config > Video(GS) > Plugin Settings, and set the Internal Resolution to "Native", or set the Renderer to Software mode by selecting one of the (Software) options. This page was last edited on 2 March 2018, at 19:56.